Clark Botanic Garden in Albertson, Nassau County, NY was founded in 1969. Sprawling across 12 verdant acres, it functions as a living museum to educate the public about a wide variety of flowers and trees. Admission is free, but voluntary donations are greatly appreciated. 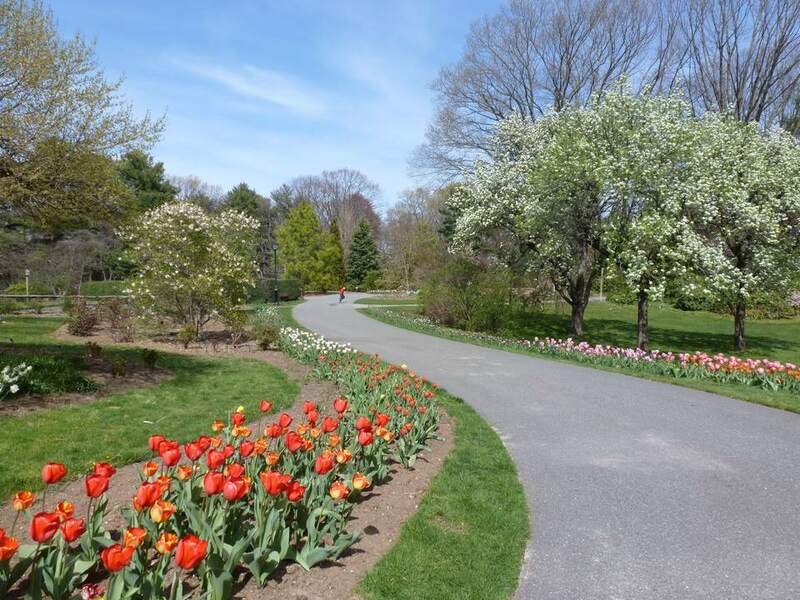 The Long Island garden was designed by Alice Recknagel Ireys (1911-2000), a landscape architect who created the Fragrance Garden at the Brooklyn Botanic Garden, various gardens for the New York Botanical Garden in the Bronx, and over 1000 public and private projects. Bring the whole family to this quiet oasis on Long Island. There's something for everyone. The garden features an easy-to-navigate Hedge Maze with mini-twists and turns. Designed for children, the maze is formed by small-leafed holly, a dense evergreen shrub from Japan. The garden brims with colorful flowers in the spring and summer months. From low-growing, brightly-hued blossoms to taller tulips and more, Clark Botanic Garden is a feast for the eyes. Among Clark Botanic Garden's scenic features are a lovely pinetum, a delightful collection of coniferous trees. These trees have male and female cones and needle-shaped leaves. Many are evergreens. Trees featured in this area of the garden include cedars, firs, spruces, hemlocks, pines and a Dawn Redwood. The garden features three tranquil ponds surrounded by lush greenery and scenic views. Stroll around those bodies of water and you might catch a glimpse of a turtle or two resting on a log while enjoying the sun. And if you look closely, you might see tiny, slender fish darting to and fro in the calm waters. One tranquil area of Clark Botanic Garden is a grove in honor of the memory of those whose lives were lost in the tragic attack on the World Trade Center on September 11, 2001. This section of the garden was dedicated by the Town of North Hempstead in 2002. Clark Botanic Garden is located at 193 I.U. Willets Road in Albertson, NY. The garden is open daily from 10 a.m. to 4 p.m., when the gates lock. Visitors are asked not to touch plants and to refrain from climbing on trees. Recreational activities such as playing ball, etc., are not allowed in the garden. Dogs are not allowed. If you ride your bike to the garden, you must leave it at the bike rack at the garden. Children under 16 years of age must be accompanied by an adult at all times in the garden. The garden's gift shop is open daily except Tuesday from 11 a.m. to 3:30 p.m. Directions: You can take the Long Island Rail Road Oyster Bay Line to the Albertson station. Clark Botanic Garden is just east of the station. If you're traveling by car, take the Northern State Parkway to exit 29/Roslyn Road, and then turn south onto Roslyn Road. Make a right onto I.U. Willets Road, than a right into the garden's parking field, which is located just before the LIRR crossing. Or take the Long Island Expressway to exit 37. Turn south onto Willis Avenue. Drive approximately one mile and then turn left onto I.U. Willets Road. Drive about four more blocks, crossing the LIRR tracks. The garden will be to your left. You can also reach the garden by taking the N23 or the N27 bus to I.U. Willets Road, and then walk east for a quarter of a mile. For more information or to learn about educational programs and events for children and adults, you can visit the Clark Botanic Garden website.